A US Coast Guard cutter docked in San Diego with a 14-ton cargo of cocaine seized off the coast of Central and South America. It is the biggest haul in years, with the wholesale value of the drugs estimated at $424 million. The actual street value of the cocaine is much higher, noted Vice Admiral Charles Michel, the Coast Guard’s Deputy Commandant for operations, at a press conference in San Diego. 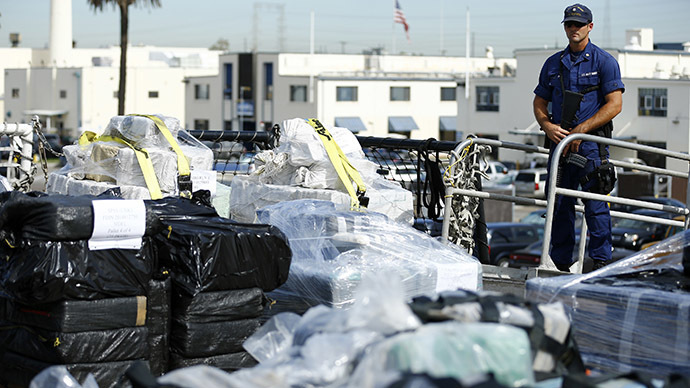 Reporters were shown the pallets of drugs seized by the cutter Boutwell during a 79-day cruise in the eastern Pacific. The drugs were seized in 19 separate actions, though almost 11 tons were captured from just one ship. Boutwell’s haul puts the total amount of cocaine seized along the Pacific coast of Central and South America in the past six months at 28 tons, and it’s valued at approximately $848 million. Coast Guard ships teamed up with the US Navy and Royal Canadian Navy vessels to seize contraband and arrest 101 suspected smugglers in what officials have called the most successful drug interdiction operation in the region since 2009. “It takes a network to defeat a network,” Admiral Michel told reporters at Naval Base San Diego, as the cocaine was unloaded from the ship. He warned that the mission was not made easier by the lack of resources and an aging fleet. Commissioned in 1968, the 378-foot long Boutwell (WHEC-719) is a ‘Secretary’ class high-endurance cutter, with a crew of 170. She is named after a politician who served as Secretary of the Treasury under President Ulysses S. Grant. Refitted in 1990, the cutter fought in the second Iraq War in 2003 and was assigned to San Diego in 2011. Her current commanding officer is Captain Edward Westfall. Eight Secretary-class ships currently in service are supposed to be phased out in favor of the newer, Legend-class cutters. The Coast Guard’s recently announced Western Hemisphere Strategy calls for increased US and allied presence in the eastern Pacific and the Caribbean, identified as the major drug transit zones from of Central and South America.